Following on from a coupe of acclaimed albums as one third of the trio, Third Reel, saxophonist and clarinettist Nicolas Masson focusses this new album on his own compistions and quartet, highlighting to fine effect his mastery of the ballad. 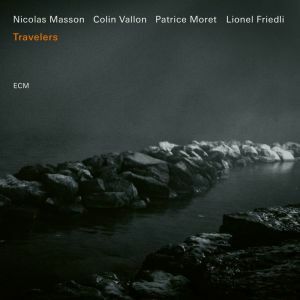 The quartet have been a touring unit for twelve years as Nicolas Masson's Parallels and this rapport built over a long period of time is immediately evident. Masson's compositions are often thoughtful, and seemingly self restraining in that the members of the quartet, who are often given a free reign in how they interpret the music, focus tightly as a unit to support the material and each other as if to maximise any hidden depths that they may have yet to discover in the songs. Perfect examples of this ploy are heard on two long ballads,'Fuchsia' and 'Almost Forty' where the leader's tenor saxophone caresses the melody and whose improvisation does not feel the need to stray far from the composition, finding plenty to say with few notes and beautiful tone. This is matched by Vallon's thoughtful solo on 'Fuchsia' that is in complete sympathy with Masson. This is sharply contrasted with 'The Deep' with splashes of colour from the drums, and a very unsettled feeling throughout. As well as tenor, Masson also plays some delectable soprano, pure toned with spot on intonation that suggests a more sinister edge that bubbles below the surface, a more powerful voice that could be unleashed if called upon. However, on this outing such power remains dormant, and we are treated to once again to ballad playing of an exemplary nature on the title track. The closing track 'Jura' once again finds Masson back on tenor with his gentle line unfurling over an exploratory contribution from the rhythm section. Bass and drums edging at giving the piece a lift, with the tenor holding back and Colin Vallon's piano caught somewhere between the two camps. This gives the piece a delicious tension, and the pianist's accompaniment with lyrical lines matching the leader's solo,at the same time trying to keep the rhythm section grounded. A great track with which too draw a close on a fascinating and absorbing set.